Ocean Minded is the kind of company that gets its hands dirty to keep the ocean clean. To kick off Earth Day, Ocean Minded headed down to Trestles for a beach cleanup. 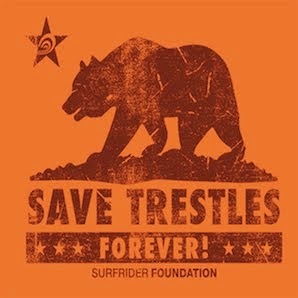 Then, a few days later, the company presented a hefty check to the Save Trestles campaign. Founder, Gary Ward, has been on the forefront of the Trestles fight and we owe him, and his eco-friendly company, an enormous THANK YOU! Support those who support us! And be sure to join the next Ocean Minded beach cleanup...they are out there regularly. This company gets dirty to keep the beach clean. Please join us for a kick off to earth day at a beach cleanup!! Where: Meet at the Trestles Parking lot.